* This is my column in BusinessWorld last July July 9, 2018. Among the big topics that dominated last week’s global and national reports are (a) US-China ‘trade war’ which technically means equalized high tariff (EHT), and the hard push for Charter change towards federalism by the Duterte-appointed Constitutional Commission (ConCom). The US-China EHT or ‘trade war’ officially started last Friday, July 6. The US slapped 25% tariffs on imports from China worth $34 billion and the latter immediately slapped a higher tariff on equivalent value of imports from the US. There will be a follow up EHT from the US up to $550 billion worth of imports from China and the latter is expected to have its counterpart. Meanwhile, funds have fled stock markets of countries that are expected to be net losers of this trade spat. China’s Shenzhen and Shanghai are the worst-performing stock markets in the world this year, having suffered a -19.1% and -16.9% drop in index values year to date (Ytd) or from January 02 to July 06, 2018, largely because of this EHT spat. In comparison, the US’ DJIA experienced only a -1.5% decline year to date. 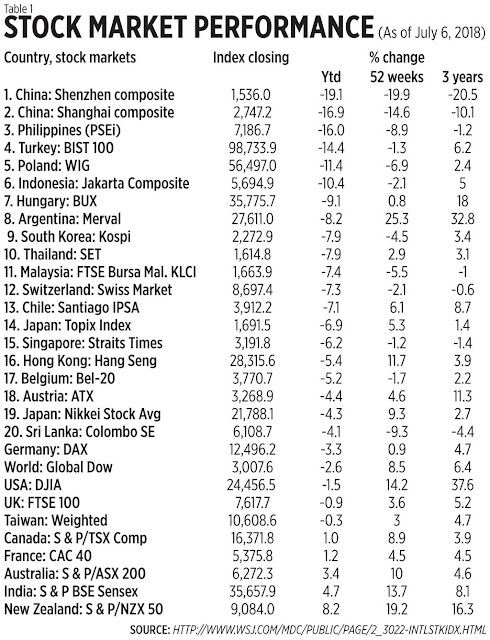 It is worth noting that the Philippine Stock Exchange (PSEi) is the 2nd worst-performing stock market in the world after China. Several business uncertainties in the Philippines this year helped pull down the PSEi: (a) sharp rise in inflation rate after TRAIN 1 law, (2) changes in fiscal incentives and corporate income tax under TRAIN 2 bill, (3) wholesale closure of Boracay island for six months, (4) political uncertainties due to rabid federalism and Charter change hard sell by the government, (5) “Iglesia ni Duterte” vs “idiotic God” pronouncements, among others. The PSEi level is also -1.2% compared to past three years, indicating that the gains under the previous administration have been wiped out under the Duterte government. 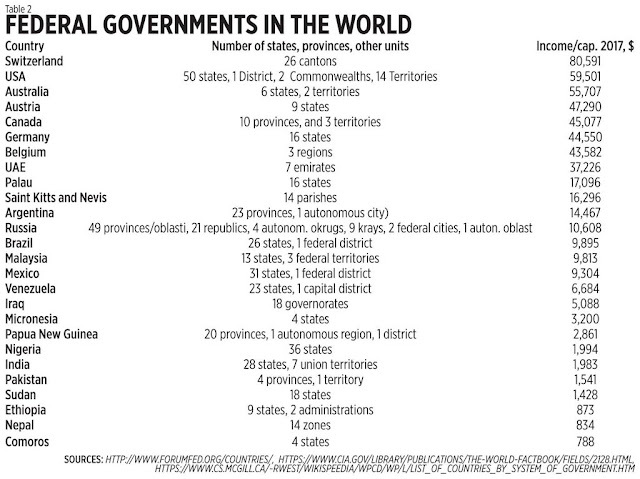 This further shows that the federalism hard sell is misguided for at least three reasons. One, a big and bureaucratic national government on the top will have another layer of big and bureaucratic state governments in the middle, aside from expanding municipal/city and provincial governments. Two, federalism is no guarantee for economic prosperity nor political maturity. While several developed economies have federal structures, the same can be said about some failing economies. And three, the current Congress that will finalize the contents of the revised Constitution is too handicapped by clear lack of independence from the Duterte presidency. Thus, potential desires by this administration for continued stay in power beyond 2022 can easily be granted by Congress. Trade protectionism is wrong as it penalizes the consumers while fattening the protected local players. “Trump protectionism” is similarly ill-intentioned but “Xi/China protectionism” is even worse. A move towards equalized low or zero tariff is needed. The hard sell for Federalism is wrong as it will penalize local businesses and entrepreneurs with more national and local/state taxation and regulations while fattening many national and local/state agencies and bureaucracies. A move towards shrinking national taxes and agencies should have been done before federalism is pushed.